Ready to breathe new life into your kitchen cabinets in Hunters Creek Village? Is painting an option? Have you grown tired of the style, color or finish on your kitchen or bathroom cabinets? If so, you might be ready to rip them out and replace them! Hang on, there is probably a better way. 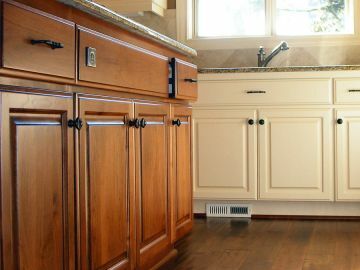 A much more cost-effective way: Simply call Palmer Pro to paint your kitchen cabinets in Hunters Creek Village or we can stain them, if you'd prefer. The trusted Hunters Creek Village Texas painting contractor, Palmer Pro, also specializes in refinishing cabinets or painting them to your specifications. You can get a beautiful set of cabinets at far less than the cost of replacing them. We pride ourselves on providing quality work and outstanding results, every single time. While you could replace all of the kitchen cabinets in your Hunters Creek Village home, painting them is a much less expensive approach, Especially when you call (832) 410-1868 for a free quote. Call the team at Palmer Pro for an affordable solution. What's more, painting or staining your Hunters Creek Village cabinets can deliver outstanding results. If you're looking for a simple, elegant way to update your kitchen, this is it. After they have been stained or painted the shade of your choosing, add a personal touch with new hardware and you've got an entirely new look! The same quality company that you see painting houses in Hunters Creek Village also specializes in cabinet staining. We never miss a step, from sanding, to matching colors, to choosing long-lasting paints, Palmer Pro will come up with a cost-effective means to update your kitchen or bathroom. Our professionals are reliable and skilled, and we always go the extra mile to deliver to your fullest expectations. Dedicated to quality and pristine results, we pride ourselves on a solid work ethic and quick turnaround times. When you call Palmer Pro for your Hunters Creek Village cabinet finishing project, you won't have to worry about sloppy prep work, inexperienced crews or a project that takes forever. Instead, you'll get a beautiful new room in the blink of an eye. What's more, our services aren't only high quality, they are also affordable. Call (832) 410-1868 for an accurate quotes to help you budget the project. Hire us to complete the work and we'll stick to that budget! To learn more, contact our Hunters Creek Village cabinet painters today. We'll answer any questions you may have and take the steps to start plan your project.